This program is for skiers aged 12-19 who are interested in improving ski skills and having fun adventures in the sport but have less interest in “training” or racing. Winterfit caters to the newer skier by advancing their skills while simultaneously challenging the more experienced skiers. Athletes from other disciplines will find Winterfit a great way to learn cross country ski skills and stay fit for their other sports. Our mandate is to promote a variety of fun winter outdoor experiences including backcountry touring, ski orienteering, as well as the continual development of skate and classical ski techniques. The program will also introduce skiers to backcountry safety, winter camping and outdoor leadership. Ultimately our goal is to foster a love of skiing and outdoor winter life. Athletes are encouraged to establish their fitness goals over the winter and how these goals can contribute to other activities they may be involved in. 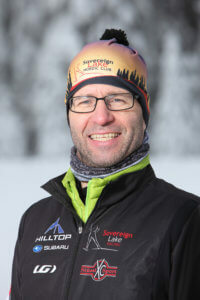 Participation in various fun cross country ski events is also encouraged but is not mandatory. Introduce a variety of “adventure based” activities: snowshoeing, telemark, orienteering, etc. * a SLNC membership and a current season’s pass is required for participants this program. WinterFit Participants will need classic and skating equipment as both techniques will be taught. If new to skiing and you have 1 (or no equipment) set of equipment, rentals are available to Program Participants for $50 for the season. Please see SLNC staff for help. Retail – Stussi Sports in Vernon provides an excellent selection of quality kids and adults gear with advice to match. They also have a rotating “kids gear exchange” program and info on ski swaps. They are a huge supporter of our club, programs and events.